Made in the USA with patent pending. The Hayes Bar Puller is made in the USA (with patent pending) and features a modular design that allows for unlimited expandability and customization. This newly designed bar puller has unprecedented expandability, unparalleled durability, yet is available to you at lower cost then current solutions. Additionally, this new bar puller is more adaptable than current bar pullers, allowing you to pull metric or inch bars, in 1/8" 1/16", or 1mm increments. 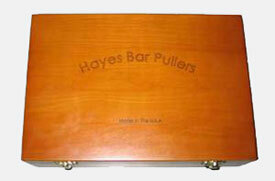 Our basic kit is the Hayes Original Bar Puller. This kit will pull bars from 3/8" to 1-1/2", in 1/8" increments, and includes two bodies and 10 tips, packaged nicely in a durable, handsome, wooden storage case. The bar puller consists of only two pieces, a body and a tip. The tips are interchangeable on the bodies, allowing for unlimited customization. Whether you're pulling metric or inch bars, whether your CNC needs a body with a 1-1/2" or 2" diameter, the Hayes Bar Puller will satisfy your demands. No, we aren't reinventing the wheel, but we can provide you with a better bar puller. Video of the bar puller in action below. The new Hayes Bar Puller. Watch as the lathe cuts a sample piece... When it finishes the piece, notice how quickly and smoothly the bar puller pulls the bar through the chuck. And remember, our products are proudly made in the USA, by machinists who are dedicated to superior quality and smooth simplicity. Buy a Hayes Original Bar Puller Kit, the only bar puller you'll trust from the first time you use it.